Explanation: This lovely view from northern Spain, at Cape Creus on the easternmost point of the Iberian peninsula, looks out across the Mediteranean and up into the stream of the 2002 Leonid meteor shower. 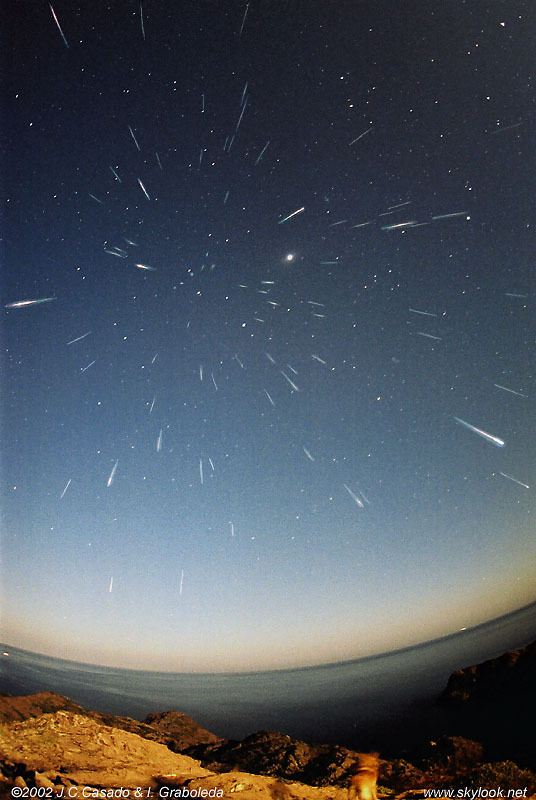 The picture is a composite of thirty separate one minute exposures taken through a fisheye lens near the Leonids' first peak, about 4:00 Universal Time on November 19. Over 70 leonid meteors are visible here, some seen nearly head on, with bright Jupiter positioned just to the right of the shower's radiant in Leo. Perched on the moonlit rocks at the bottom right, the photographers' dog seems to be watching the on going celestial display and adds an interesting visual element to the scene. What's the dog's name? Leica, of course.